Danzig - "Circle of Snakes"
I loved the first two Danzig records and then sort of didn’t hear much of them the next 5. Here we are in 2004 and number 8! The CD opens with the dark, eerie "Wotan’s Procession". Next up is "Skin Carver", a very heavy dark song, ready for the next Wes Craven movie! This is back to the classic first album feel for sure and a pretty cool production sound as well. Vocals are deep in the center of the music where they should be, rather than way out front. There are some extremely cool guitar riffs from Tommy Victor (PRONG), a bit Zakk Wylde like at times. 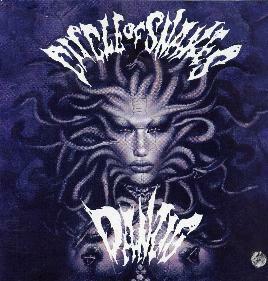 "Circle of Snakes", the title track, is brutal as well. "1000 Devil’s Reign" is a more melodic track most likely to get any radio play with the melodic singing. It has a great doomy riff and groove though. "Skull Forest" is a slow building ballad. "Hellmark" is the fastest hard driving track on the CD and classic Danzig sound. He really belts out the lyrics! "When We Were Dead" has one of the coolest guitar riffs I have heard in a while and is very doomy! "Night Be Sodom" is very Samhain like. "My Darkness" is a really melodic doom song. "Netherbound" is a riff right out of the Solitude Aeternus book. "Black Angel-White Angel" closes the CD. I was damn impressed with this effort. Danzig is back to the roots of evil. For more information you can visit the Danzig web site at: http://www.danzig-verotik.com.